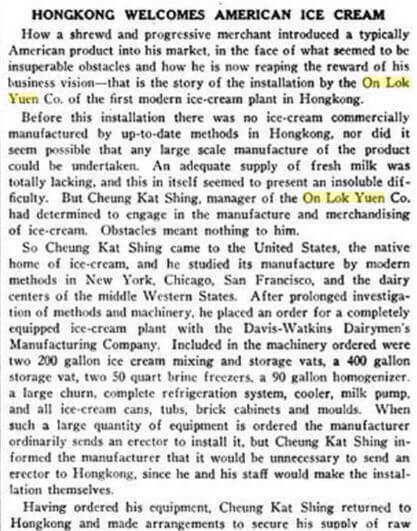 Founded and managed by the religious Cheung family, On Lok Yuen was a leading maker of ice cream, biscuits and confectionary in Hong Kong for over half a century, from 1920 to 1974, with its factory in Causeway Bay and its own network of restaurants. 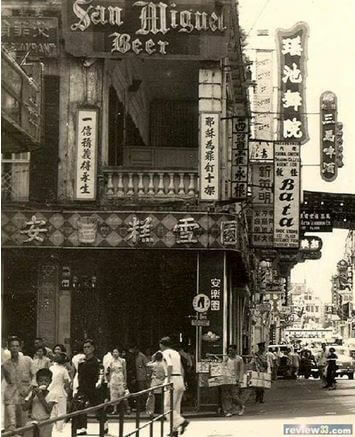 Its flagship restaurant was located at 25-27 Des Voeux Road, Central, where the On Lok Yuen Building still stands. 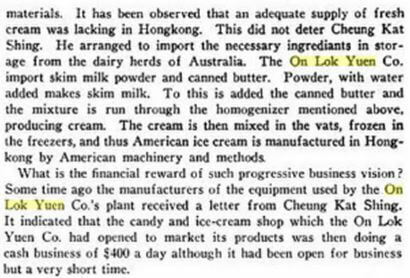 To many local Chinese families in Hong Kong, On Lok Yuen was their first introduction to Western food and ice cream and On Lok Yuen was also the first ice cream manufacturer in Hong Kong. On Lok Yuen was founded by Kaiping (Hoiping in Cantonese) native Cheung Kat Shing (張吉盛, 1880-1963) as a sole proprietorship. 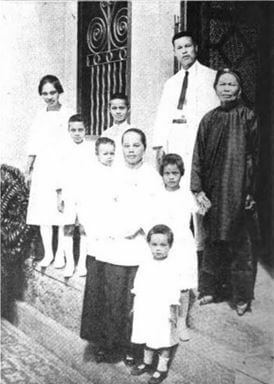 Allegedly Cheung started out as a barber on Caine Road and his fortunes changed after he was baptized in 1901 at the age of 20. With the support of a Christian minister, he started On Lok Yuen as a café in 1909 in Central, serving primarily Western food and beverages. A devout evangelical Christian, Cheung blurred the lines of religion and business, closing his business on Sundays and Christian holidays, incorporating scriptures (such as John 3:16) into his biscuits, menus and store signage, bringing in preachers to convert his staff and always happy to host fundraisers for Christian groups at his restaurants. He was deeply involved with the Methodist Church (especially the one in Wanchai) throughout his life and when he incorporated On Lok Yuen as a company in 1920 to raise outside capital for expansion, he brought in a number of Chinese Christian leaders such as the renowned contractor and philanthropist Lam Woo (林護, whose brother Lam Kau-mow 林裘謀 was later chairman of On Lok Yuen), financier Li Yuk-tong (李煜堂) and Dr. Ho Lok-kum (何樂琴 aka Ho Nai-Hop, the first medical officer in the New Territories) as investors and directors. Together with these Chinese Christian merchants, he also contributed financially to Sun Yat-sen’s revolutionary causes. 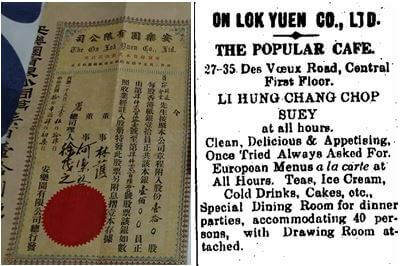 By 1921, the On Lok Yuen café was already quite a popular establishment, occupying the first floor of 27-35 Des Voeux Road, including a special dining room that could accommodate 40 guests and serving hot and cold drinks, Western food, cake, chop suey and ice cream. 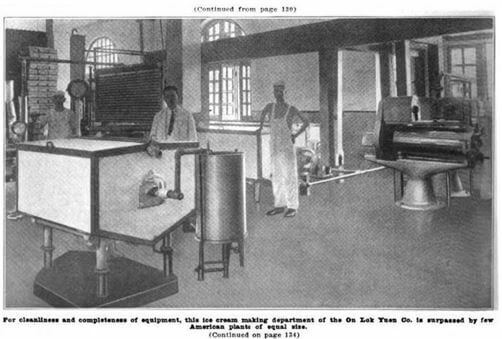 The On Lok Yuen factory was located in a four story, 18000 square feet building at the intersection of Whitfield Road and Hing Fat Street in Causeway Bay. In the summer of 1927, a second restaurant was added in 297 Des Voeux Road Central in Sheung Wan. 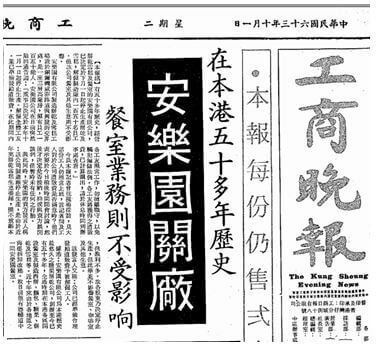 (香港華字日報, 1927-08-16). For raw materials, the company imported on a monthly basis 5000 bags of American flour (each weighing 50 pounds), 48000 pounds of sugar from Java, 1000 pounds of fresh milk and an equal amount of powdered milk and $8000 worth of tin for containers in addition to chocolate, cherries, raisins, currants and coloring matter. The only two ingredients that were sourced locally were nuts and eggs, the latter were purchased by the hundreds. By this stage the company had firmly established itself as a leading biscuit and confectionery manufacturer in South China alongside M.Y. San and M.P. San discussed in the Three Kings of Biscuits article, linkd below, and its products were popular locally as well as in Southeast Asian markets. By 1938, On Lok Yuen already had at least 5 branches in HK and Kowloon including one in 377 Nathan Road in Yaumatei and one in 36 Queen’s Road Central (re-developed into Hing Wai Building in 1956 where it maintained a restaurant after the re-development) and also had restaurant and manufacturing operations in Canton. During the Japanese occupation, Cheung Kat-shing was stranded in HK and served as chief evangelist for the HK Christian Association, a group created by the Japanese military government to supervise Church activities in occupied Hong Kong. 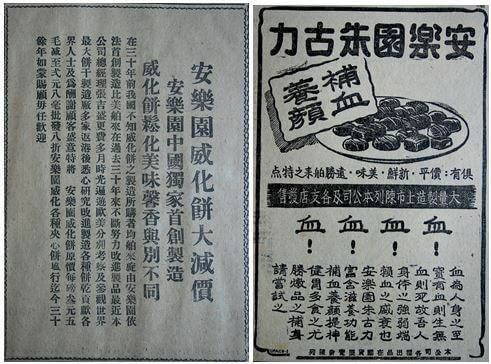 Business recovered quickly after the War and in 1946, the firm reported profits of HK$1.1 million (華僑日報, 1947-07-30) which dropped to $676,220 in 1947 (華僑日報, 1948-03-11). At the time, respected Chinese leader Benjamin Wong-Tape OBE JP (黃炳耀, comprador of Sun Life and Urban Council member; New Zealand Chinese who is buried next to Sir Robert Hotung in the HK Cemetery in Happy Valley) was chairman of the firm (succeeding Lam Kau-mow who had died during the War) and board members included managing director Cheung Kat shing and his sons Peter (張彼得, whose wife U Oi-yen余愛恩 is the daughter of U Sze-wing 余仕榮, the Chinese comprador of Dodwell & Co)) and John (張約翰); Lam Woo’s son Lam Chik-Ho (林植豪, for details of his life, view the profile written by the author at chinacomestomit.org) and nephew Lam Yat-man (林逸民); Li Yuk-tong’s sons Li Chi-chung (李自重) and Li Ping-chiu (李炳超); Tai Tung-kei (戴東錡, whose son HH 戴翰鏗 is married to Ruth U余如鳳, the sister of Peter Cheung’s wife) and Cheung’s church partner Watt Lok-hing (屈樂卿,1881-1959, father of real estate developer Watt Mo-Kee and HK Technical College (now PolyU) head Watt Hoi-Kee). 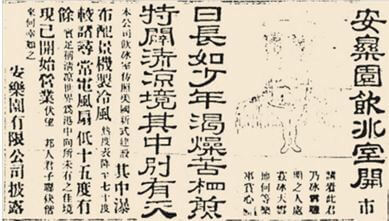 In 1949, the firm recorded $783.933 in profits (華僑日報, 1950-05-22). The same year, the Communists took over Canton and On Lok Yuen’s operations in the city were subsequently merged with other private firms to form a state owned enterprise. On Lok Yuen flagship restaurant at the corner of Queen’s Road Central and D’Aguilar Street next to the King’s Theatre in Central in the 1950s. The two lines of Chinese under the San Miguel sign read “Jesus was crucified for our sins” and “Believe in Him if you seek Eternal Life”. The 1950s was a prosperous decade for On Lok Yuen and Cheung Kat-shing remained hands on despite of his advanced age, traveling overseas to learn about the latest developments in the industry. 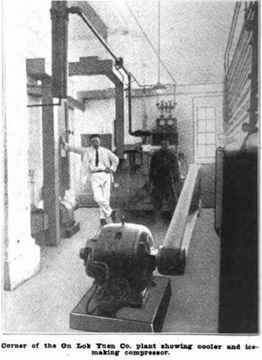 In the meantime, his two sons Peter and John, who had joined the business in the 1930s, assumed more and more responsibilities. Outside of business, Peter was just as religious as his father and once considered going to theological seminary and devoting his life to missionary work. He was awarded the MBE in 1959 for his contributions in leading the Auxiliary Fire Brigade during its formative years in the 1950s (華僑日報, 1959-01-20). 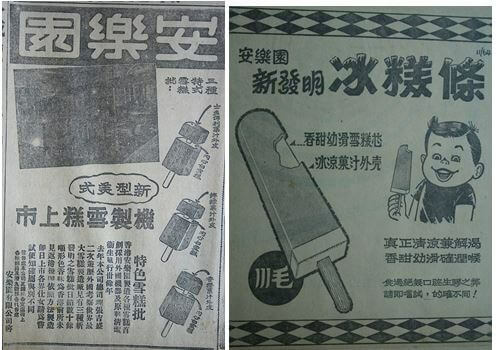 Left: On Lok Yuen ad in the 1950s promoting its wafers’ 20% off sale from $3.50 a pound to $2.80 a pound. It claims to be the first Chinese firm to make wafers and also talked about Cheung Kat-shing’s recent trip in the US and Europe touring the world’s leading biscuit factories to learn the latest techniques. 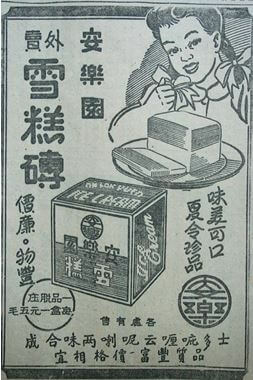 Right: On Lok Yuen ad in 1949 touting the “health” benefits of its chocolate claiming that it can help with blood circulation. In 1961, the firm’s flagship store was re-developed into the 14 storey On Lok Yuen Building with three Christian groups – YMCA, the Lingnan Club and Caritas Youth Centre taking up the top three floors. In 1963, Cheung Kut-shing passed away at the age of 83 and was survived by his wife, 3 sons, 5 daughters and 9 paternal grandchildren. (華僑日報, 1963-07-03). While Peter and John Cheung were well groomed to take over the business, the competition had become more intense as the economy took off in the 1960s and 1970s and one by one the restaurants were also shut down thanks to property re-development. Most members of the founder’s family also lacked the interest to join the family business, preferring other professions, building churches or living abroad. 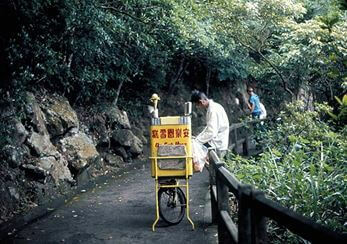 On Lok Yuen ice cream vendor on the Peak in the 1960s/70s. Peter Cheung and his family moved to Australia where he passed away in Melbourne in 1984. He was survived by his wife, 3 sons (Titus, Philip and Matthew) and daughter Diana. In addition to the Auxiliary Fire Brigade, he was a trustee of the Church sponsored Chung Chi College and was a Justice of the Peace. Interestingly, On Lok Yuen lives on not only through On Lok Yuen Building but through Wing Lok Yuen restaurant on nearby Chiu Lung Street in Central. Founded in 1976 by former On Lok Yuen staffers. the restaurant’s famous hotdogs with its secret sauce are allegedly based on the original On Lok Yuen recipe. 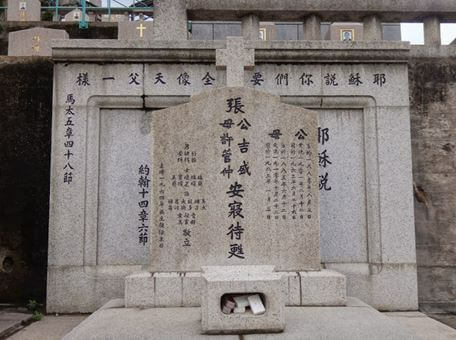 The grave of Mr & Mrs Cheung Kat-shing in the Pokfulam Chinese Christian Cemetery. The upper line is Matthews 5:48 which reads “Be perfect, therefore, as your heavenly Father is perfect.”and line behind the tombstone is John 14:6 which reads “Jesus said to him, “I am the way, and the truth, and the life. No one comes to the Father except through me.” Tombstone also recorded the exact date of baptism for the couple. This article was first posted on 12th May 2017.